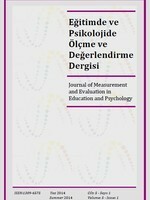 Journal of Measurement and Evaluation in Education and Psychology is a is free and peer-reviewed journal that is published under international standards and aims to sharethe observed dynamic problems in Turkey and around the World, solutions to these problems, and the latest developments in the subject field with teachers, administrators, researchers, scholars, and students. Symposium, meeting, and workshop announcements. The manuscripts that address the current problems in the fields of education and psychology and the ones that provides solutions to these problems, and the manuscripts thatdeal with experimental studies in a scientific perspective are included. Are Differentially Functioning Mathematics Items Reason of Low Achievement of Turkish Students in PISA 2015?